Italian is my favorite cuisine. Take me to an Italian restaurant, you will never find me ordering the fish. If you ask me, it’s just not right. Italian for me means major carbiside overload, and a well worth it at that. “What is carbiside?” you may ask? An overloaded intake of carbohydrates of all kinds; pasta, bread, rice, cakes, pastries… and the list goes on. Truth is, as much as Jonathan would hate for me to admit; (he’s a huge fan of a balanced meal with a protein, carbohydrate and vegetable), my favorite type of meal is a carb filled meal. I sometimes wish that I could be one of those girls who think to themselves, I must order the fish or I’m only eating vegetables this week, but I just cannot do it. That to me is the strongest form of torture… I want what I want, when I want it. 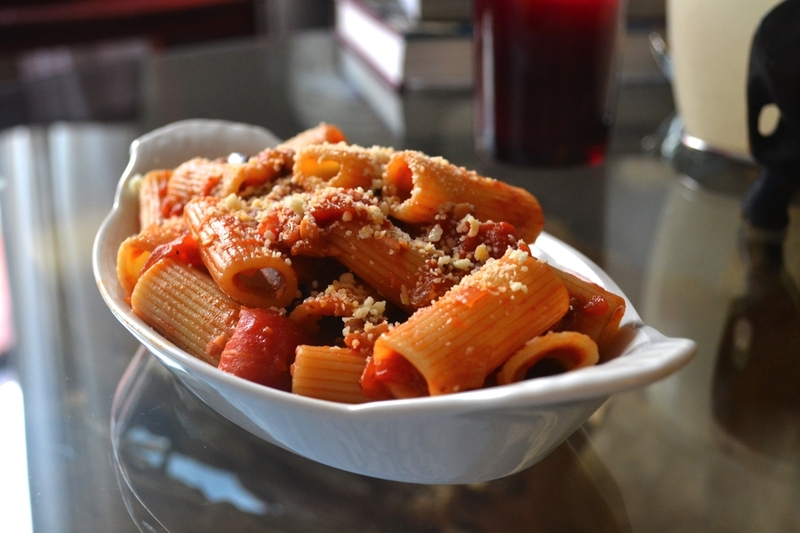 One of my favorite Italian dishes is Rigatoni alla Norma. Yes it sounds fancy but what is it really? A sicilian specialty: a tomato and eggplant based sauce with pasta. Think pomodoro but with that extra treat of the eggplant. The flavors mixed together are so rich and delicious that it is just impossible to say no. Last weekend I went apple and pumpkin picking in Westchester and stopped by a farmer’s market to pick up some fresh produce. I lucked out on a huge bag of baby eggplants, and being that I need to get through them over the next week, I decided to bottle up that amazing alla Norma sauce. Now whenever I have that craving for a good old carbiside session, I don’t have to go very far. Place eggplant cubes in a strainer and sprinkle with 1 tablespoon salt. Leave for 15 minutes to drain of water. Meanwhile, heat a saucepan with olive oil and saute the onions and garlic on medium heat until slightly golden, about 8 minutes. Add in the tomatoes, balsamic vinegar, sugar,chile pepper, basil and the extra salt and leave to cook for about 10 minutes. If the sauce looks like it is becoming to thick, add 1/4 cup water. Bring another saucepan filled with water, to a boil and cook the pasta for the suggested time. Preheat a skillet with olive and transfer the eggplant in. Saute for about 5 minutes, turning every few minutes, so that the eggplant is golden and soft on all sides. Add the eggplant into the tomato sauce and mix in well. Drain the rigatoni then transfer into the sauce and toss until coated well. This looks amazing! I’m the same way – carbs 110% of the way! Sometimes I feel guilty but then it’s like “eh, oh well! i’ll just drown my guilt in more carbs! : haha! Its always too good to feel guilty about Wee Eata!